1) (ancient Lords of the Isles). Or, an eagle displ. with two heads gu. (some have the eagle with only one head) surmounted by a lymphad sa. in the dexter chief point a dexter hand couped gu. Crest—A raven sa. standing on a rock az. 2) (Slate, Isle of Skye, bart., 1625). Quarterly, 1st and 4th, ar. a lion ramp. gu. ; 2nd, or, a dexter arm in armour couped in fess ppr. the hand holding a cross crosslet fitchée gu. ; 3rd, or, a lymphad, oars and sails sa. flags flying gu. ; 4th, vert a salmon naiant ppr. 3) (Bosville-Macdonald, Baron Macdonald, of Slate, co. Antrim). Quarterly, 1st and 4th, counterquartered, as the last; 2nd and 3rd, ar. five fusils in fess gu. in chief three bears’ heads sa., for Bosville. Crest—A dexter arm in armour couped in fess ppr. the hand also ppr. holding across crosslet fitchée gu. Supporters—Two leopards ppr. collared or. Motto—Per mare, per terras. 4) (East Sheen, co. Surrey, bart.). Quarterly, 1st, ar. a lion ramp. gu. ; 2nd, or, a hand in armour holding a cross crosslet fitchée gu. ; 3rd, a row-galley, the sails furled sa. ; 4th, ar. a salmon naiant in fesse ppr. Crest—A hand in armour holding a cross crosslet fitchée gu. Motto—Per mare, per terras. 5) (Moydart, Scotland, Captain of Clanranald). Quarterly, 1st, ar. a lion ramp. gu. armed or; 2nd, or, a dexter hand couped fessways, holding a cross crosslet fitchée gu. ; 3rd, or, a lymphad, oars in saltire sa. and in base a ealmon naiant in a sea vert; 4th, ar. an oak tree vert surmounted by an eagle or. Crest—A castle triple-towered ar. masoned sa. and issuing from the centre tower a dexter arm in armour embowed, grasping a sword all ppr. Mottoes— Over the crest: My hope is constant in thee; below the shield: Dhandeon co Heiragha. 6) (Largie; heiress m. Lockhart, of Carnwath). Quarterly, 1st, or, a lion ramp. gu. ; 2nd, or, a dexter hand issuing from the left of the shield ppr. holding a cross crosslet fitchee gu. ; 3rd, ar. a lymphad, sails furled and oars in saltire sa. ; 4th, vert a salmon naiant in fess ppr. Crest—A dexter arm from the shoulder ppr. holding a dagger in pale ppr. Mottoes—Over the crest: Semper pugnare paratus; below the shield: Pro patria. 7) (Sir John MacDonald, K.C.B., 1818). As Slate, within a canton gu. charged with a mural crown or, in the first quarter. Crest—Out of an eastern crown or, a cubit arm erect ppr. encircled by a laurel wreath vert, in the hand a dagger erect also ppr. hilted and pommelled or. 8) (General Sir John MacDonald, G.C.B., 1849). Quarterly, as Slate, within a bordure gu. Crest and Motto, as Lord Macdonald. 9) (St. Martin’s, co. Perth, 1849). Quarterly, as Slate, within a bordure az. charged with two mascles in chief ar. and a boar’s head erased in base or. Crest—A demi lion gu. holding in his dexter paw a hand ppr. Motto—Per mare, per terras. 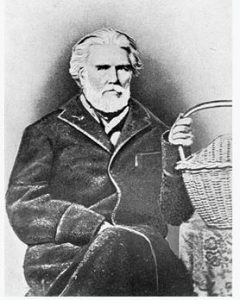 10) (Foote-MacDonald, heir of line of Knoydart, 1850). Quarterly, as Slate, within a bordure gu. charged with three antique crowns or. Crest and Motto, as Lord Macdonald. 11) (Craig-na-Gower, co. Argyll, 1875). Quarterly, 1st, or, a lion ramp. gu. ; 2nd, or, a dexter hand fessways couped at the wrist, holding a cross crosslet fitchée gu. ; 3rd, or, a lymphad, sails furled sa. ; 4th, per fess ar. and vert a salmon naiant ppr. Crest—A dexter arm in armour fessways couped below the elbow ppr. the hand holding a cross crosslet fitchée gu. Motto—Per mare, per terras. 12) (Holland, 1685). Quarterly, 1st, ar. a lion ramp. gu. ; 2nd, az. a dexter hand couped fessways, holding a cross crosslet fitchée ar. ; 3rd, or, a galley, oars in galtire sa. ; 4th, per fess wavy ar. and vert, in base a fish naiant of the first, all within a bordure quarterly gu. and ar. Crest—The Holy Bible expanded ppr. Motto—Coelestia sequor. 13) (Edinburgh, 1878). Quarterly, ar. and or, in the first quarter a lion ramp. gu. ; in the second a dexter hand couped fesseways, holding a cross crosslet fitchee of the last; in the third a lymphad, sails furled and oars in saltire sa. ; in the fourth a salmon naiant ppr. overall on a fesse of the third a cushion of the second. Crest—A dexter hand holding a dirk erect ppr. Motto—Nec tempore nec fato. The MacDonald Surname means ‘descendant of Donald’ and it derives from the Scot Gaelic Mac Dhomhnuill. The origin of he first name Dhomhnuill was a nickname that means ‘world ruler’. It became one of the most popular first names being held by many Kings and one Saint. This family dominated the Hebridge between the 13th and 15th centuries from their island of Islay, they were also the Clan that held the title of Lord of the Isles. However, true MacDonalds are descendants of the Scottish clan of the name. They are one of the group of Scottish clans who claim descent from Conn of the Hundred Battles, the legendary Irish king, through Colla Uais, who colonised the Hebrides. Their name comes from Donald of Islay, one of the sons of Somhairle, Lord of Argyle. By the fifteenth century, they were the most powerful clan in Scotland, controlling the entire western coast of the country. Their involvement in Ireland was continuous from the thirteenth century, when they first arrived as gallowglasses, or mercenaries; such was their fame that they were employed in virtually every local war, spreading and settling throughout the country over the following centuries. Inevitably, their main connection remained with Ulster. They rapidly acquired territory and power on their own account, both in Ulster – branches of the family established themselves in Tyrone, Fermanagh, Monaghan and Antrim and elsewhere. Given the where and how the surname originated, the confusion with MacDonald is understandable; According to MacDonald DNA Group and Clan MacDonald the Irish MacDonalds in fact share their ancestry with most Irish McDonnells. In addition, the Antrim pronunciation of the original Irish has sometimes lead to the anglicisation MacConnell, or Connell. To complicate it even more, in Ulster the most prominent native family were the MacDonnells of Clankelly, rulers of Fermanagh. They were displaced by their loss of their power there and they settled just a bit north in the adjoining County Monaghan where many still live today. Other locations that the MacDonalds were known to live include Skye, Ardamurchan and in Glencoe where an infamous massacre occured that killed many MacDonalds that was led by the Campbells Clan. 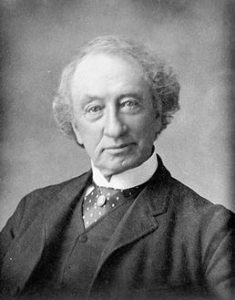 John Alexander Macdonald (1815–1891), first Prime minister of Canada, usually referred to as John A. Macdonald. MacDonald, Vice-Admiral Sir Reginald John James George, R.N., K.C.S.I., Chief of Clanranald, m. 12 June, 1855; the Hon. Adelaide Louisa, 2nd daughter of George 5th Lord Vernon and has issue, 1) Allan Douglas, born April 1856. 2) Angus Roderick born April 1858 3) Adelaide Effrida. Lineage ~ The first of the race, of whom any authentic account exists, is Somerled, designed by Scottish historians Thane of Argyll, but by foreign authors and charters extant, King of the Isles, and Lord of Argyll and Kintyre. Allan MacDonald, eldest son of John, by his 1st marriage with Amie, daughter and heiress of Roderick of the Isles, and grandson of John, last King and Lord of the Isles, commanded his father’s forces at the battle of Harlaw. He was direct ancestor of Ranald MacDonald, designated Randald Gald, who, with his grandfather, Lovat, was driven from his inheritance by a rising of the clan, which declared his cousin John, the son of Alexander, and grandson of Allan M’Rory, chieftain. This insurrection led to the celebrated battle of Blairleine, fought between the Frasers and Macdonalds, in July 1544, in which the former were defeated, and Lovat, together with his eldest son, Simon, and Ranald Macdonald himself were slain. Ranald Gald never married but left three natural sons, Allan, John, and Alexander, who received from the Crown a charter of legitimation, 18 June 1555. The victory of Blairleine secured the dignity of chief to John MacDonald, of Moydart, son, as above-mentioned, of Alexander, and grandson of Allan M’Rory. This distinguished chieftan, Captain of Clanranald during the unsettled government of Queen Mary, married 1st Mariatte M’Kane, and by her had Allan, his heir, and John, ancestor of the Glenaladale family. He married 2ndly, Penelope, 2nd daughter of Sir Charles Ershine, 3rd son of Alexander, Viscount Fenton, and by her had a daughter, married John Stewart of Appin. Clanranald died 1584 and was succeeded by his son, Allan MacDonald, Captain of Clanranald, married a daughter of Macleod, of Harries, and had issue, 1) Angus who died within the lifetime of his father without issue. 2) Donald, heir to his father 3) Ranald of Benbecula, married 1st Maria, sister of Sir Donal MacDonald, of Slate, but by her had no issue; and 2ndly Margaret, daughter of Angus MacDonald, of Dunveg, by whom he had two sons. The younger, Angus Oig, was ancestor of the families of Delelca and Milton. The elder, Ranald Oig married a daughter of M’Neill, of Barra, and had born, Donald, who succeeded to Clanrenald. He married 2ndly 1653, Ann, only daughter of John Macdonald, of Clanranaldo and had by her three sons, James, Donald Oig, and Moin. 4) John of Kinlochmoydart. 5) Margaret married Donald MacAngus Macalister, of Glengarry. 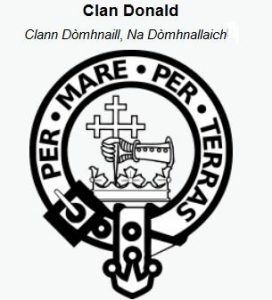 Clanranald died 1593, and was succeeded by his eldest survining son, Sir Donald MacDonald, of Clanranald, who was knighted by James VI at Holyrood, 1617. Sir Donald died 1619, leaving a son and successor, John MacDonald, of Clanranald, who powerfully supported King Charles against the Convenanters, and gallantly fought under Montrose. He survived to witness the Restoration, and paid his respects to King Charles, on his landing in the ship of Moray, 1660. He then retired to the Island of Uist and at an advanced age, 1670, leaving, by Moir his wife, daughter MacLeod, of Mac Leod, three daughters, Moir, wife of Lauchla MacLean of Coll; Catherine married McNeill, of Barra; and Ang. married Ranald MacDonald, of Benbecula, a son and successor, Donald MacDonald, of Clanranald, who had served with his father in the memorable campaigns of Montrose. Kilysyth, a gallant charge made by young Clanranald decided the victory, and after the ill-fated issue of Philliphaug Donald, stanch to his royal master, marched to Islay against the Campbells. In 1648, at the head of a considerable force he joined the Earl of Antrim, in Ireland, and was engaged all the engagements in that kingdom, until the defeat of the King’s army in the Queen’s Company, where he and Glengarry was taken prisoners. Clanranald married Marion, daughter of John McLeod of Mac Leod, and had, with a daughter, Margaret married Donald Macdonald, of Benbecula, two sons, Allan, his heir; and Ranald, successor to his brother. He died 1686, and was succeeded by his son, Allan MacDonald, of Clanranald, who, firm to the cause of the Stuarts, summoned his clain in aid of Dundee, and with his tutor, Macdonald of Benbecula, mainly contributed to the victory at Killierankie. When al hope of success for King James expired, young Clanranald refused to take the oaths to the new Government, and retired with his brother, Ranald, to France, where he completed his education, and became one of the most accomplished gentlemen of his time. After residing some years at the Court of St. Germains, he obtained a commission under the Duke of Berwick, and in a foreign land, and in a foreign service, preserved his name unsullied. 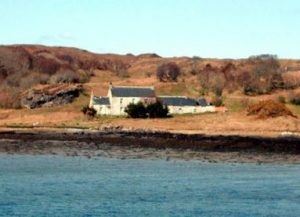 When peace was restored, he went again to St. Germains, and thence returned to Scotland, and fixed his residence at Ormiclate House, in South Uist. In this, one of the remotest of the Western Isles, he hoped to enjoy rest and tranquility, after the storms and vicissitudes of his earl life. But the calm was of brief continuance. 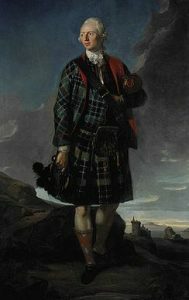 No sooner had the Earl of Mar raised his standard in 1715 than Clanranald hastened from Uist with his followers, and summoning his vassals of Arisaig and Moydart, joined the Chevalier’s army with a considerable force. In all the subsequent operations he took part, and at length sealed his devotion to the Stuart cause by his heroic death at Sheriffmuir, leading the right wing of Mar’s army. On that fatal occasion it was, that Glengarry, stepping forward exclaimed “Revenge to-day, mourning to-morrow”. Clanranald was universally esteemed and respected by friend and foe, and his memory is still fondly cherished in the Highlands. He married while in France, Penelope, daughter of Colonel Mackenzie Governor of Tangier under Charles II, but had no issue. His brother and heir, Ranald MacDonald died unmarried at St. Germains, 1725, when the succession devolved on his cousin, Donald MacDonald of Benbecula, who took no part in the insurrection of ’15, but resided in retirement at Benbecula, until, at the decease of Ranald, he became chieftain, as nearest heir male. He married 1st Margaret, daughter of Donald MacDonald, of Clanranald, by whom he had a son, Ranald, his heir; and 2ndly, Margaret, daughter of George Mackenzie, Esq. of Kildun, by whom he had Alexander, who obtained the estate of Boisdale; and Anne, wife of Lochian M’Kinnon, of Strathuradale, Clanranald died 1730, and was succeeded by his son, Ranald MacDonald, of Clanranald, born 1692; married Margaret, daughter of William Macleod, of Bernera, and had two sons and one daughter Ranald, his heir; Donald, an officer of high reputation in the British service, killed with General Wolfe at Quebec; and Margaret, who died unmarried. The eldest son, Ranald MacDonald, became, during his father’s lifetime, an able actor in the rising of 1745. He fought at Gladsmuir, marched with Prince Charles into England, and was severely wounded at Culloden. He joined Prince Charles at Paris, and obtaining military employment from the French Government, became Aide-de-camp to Marshal Saxe. He married 1st Mary daughter of Lord Basil Hamilton (younger son of the Duke of Hamilton), eventually Earl of Selkirk, and by her, who died 11 May 1750, he had one son, Charles James Somerledd, of the ancient family of Mackinnon of that Ilk, and by her had issue, John, his heir; James, an officer of rank in the army; Margaret, who died unmarried; Mary, who died unmarried; Penelope married Lord Belhaven and Stenton. The eldest son, John MacDonald, of Clanranald, captain 22nd Dragoons, Macqueen, of Braxfield, Lord Justice Clerk of Scotland; and the former of whom only he had issue, Reginald George, his heir; Robert Johnstone, and Donald. Clanranald died 1791. His eldest son, Reginald George MacDonald, 25th Captain and Chief of Clanranald, J.P. and D.L., at one time M.P. 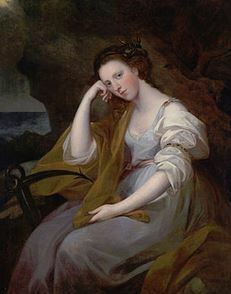 for Plympton born Aug. 1788; married 1st April 1812, Lady Caroline Anne Edgecumbe, 2nd daughter of Richard, 2nd Earl of Mount Edgeumbe, and by her (who died 10 April, 1824) had issue, 1) Reginald John George James, present representative 2) Caroline Sophia married 8 Sept. 1842, Hon. 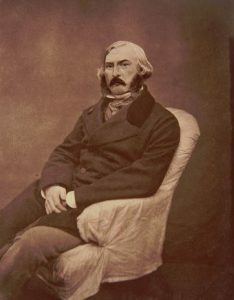 Charles Henry Cust, 2nd son of John, 1st Earl of Brownlow. 3) Emma Hamilin married 21 April, 1840, Hon. and Rev. Alfred Wodehouse, youngest son of John, 2nd Lord Wodehouse; and died 1851. 4) Louisa Emily, married 1st Charles william Marsham, Esq.. eldest surviving son of Robert Marsham, Esq. of Stratton Strawless, County Norfolk; and 2ndly 4 Dec. 1856, Col. Hugh Fitz Roy, Grenadier Guards, son of Lord henry Fitz Roy. 4) Flora (Hon.) Maid of Honour to H.M. the Queen. 5) Sarah Anne, married 1848 Baron Porcelli, a Sicilian Nobleman. Clanranald married 2ndly, Anne, daughter of William Cunningham, Esq., and widow of Richard Barry Dunning, Lord Ashburton (who died 8 July 1835); and 3rdly November 1845, Elizabeth Rebecca Newman. He died 1873. 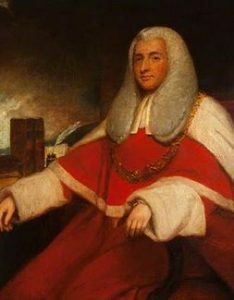 MAcDonald, John Andrew, Esq. of Glenaladale, County Inverness, J.P. and D.L., County Inverness, J.P. County Argyll, Major in the Inverness Militia, born 29 July 1837; married 30 July 1862, Helen Mary, elder daughter of Edward Chaloner, Esq. of Liverpool, which lady died without issue 14 March, 1864. Lineage ~ The Glenaladale family is the oldest endet of the Clanranald family. John MacDonald, of Glenalsdale, the 2nd son of John Moidartach MacAlister, the chief of Clanranald, who died 1584, had one son, Alexander MacDonald, of Glenaladale, who married and left four sons, Rory; Alexander; Allan; and Ranald. 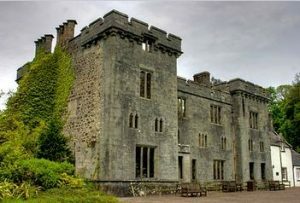 The eldest, Rory of Roderick MacDonald, of Glenaladale, left two sons, Angus and John. Angus dying without issue his brother, John MacDonald, succeeded at Glenaladale; he married and had eight sons, John, Angus, of Borrodale, whose son Alexander succeeded to Glenaladale; Alexander; Allan; Ranald; James; Rory; and Donald; and several daughters. The eldest son, John MacDonald, of Glenaladale, had two sons, Alexander and John. The elder son, Alexander MacDonald of Glenaladale, had John, Augustin, Donald, and several sons who died in infancy, and three daughters. 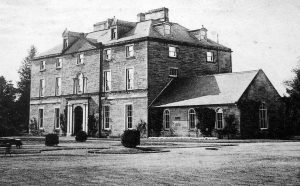 The eldest son, John MacDonald of Glenaladale, married and had four sons, William, Donald, John and Rory; and one daughter. He formed a project of leaving Scotland, and establishing his family in Prince Edward’s Island, North America, where he had purchased a tract of land; he accordingly resolved to leave the kingdom and sold and made over his estate to his cousin and nearest kin, Alexander MacDonald, eldest surviving son of Angus of Borrodale, 2nd son of John, the 4th laird of Glenaladale, by which this Alexander became proprietor of the estate of the the Glenaladale family in Scotland. He married and had three sons, John; Alexander; and Angus; the eldest and youngest havind died in their infancy, the 2nd, Alexander MacDonald of Borrodale, 2nd son of John, 4th laird of Glenaladale, succeeded him. He married 1792, Jane, daughter of Alexander McNab of Inishewen, County Perth, and by her (who died 1827) had issue, 1) Angus, late of Glenaladale. 2) Alexander married Margaret Watson, and has issue 3) John, Lieutenant-Colonel late H.E.I.C.S., severely wounded in the Indian mutiny, married 1848, Helen Morgan, and by her (who died 1855) had issue. 4) Donald (Rev.) 5) Clementine died 1874 6) Catherine 7) Margaret married Colin Chisholm, of Inverness, who died 1877. She died 1868, leaving issue. 8) Jane died 1874. John Macdonald who died 1830 was succeeded by his son, Angus MacDonald, of Glenaladale, born 1793; married 1836, Mary younger daughter of Hugh Watson, late of Torsonce, Midlothian and by her left issue, 1) John Andrew, now of Glenaladale. 2) Hugh Joseph (Rev) born 1841. 3) Angus (Rev.) B.A. London born 1844. 4) Mary Margaret a Nun 5) Jane Veronica. Mr. MacDonald died 1870. MACDONALD OF ST. MARTIN’S ABBEY. MacDonald, William MacDonald Coloquhoun Farquharson, Esq., F.R.S.E. and F.R.G.S., of St. Martin’s Abbey, County, Perth, and Rossie Castle, Montrose, J.P. and D.L., Lieut-Colonel Command. Perthshire Highland Rifle Volunteers, and Archer of H.M. Scottish Body Guard, born 26 May 182; married 26 June 1849, Hon. Clara Anne Jane Brownlow, 2nd daughter of Roderick McNeill of Barra and has issue 1) Montagu Wiliam MacDonald, Lieut. Grenadier Guards, Lieut. Forfar Militia, and Capt. Perthshire Volunteers, born 15 Jan. 1851. 2) Charles Brownlow, Lieut. R.N. 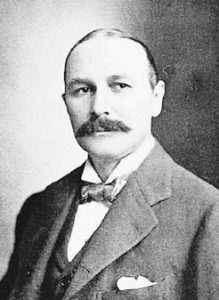 born 15 Nov. 1855. 3) Harry 72nd Highlanders, born 6 Feb. 1858. 4) Francis Roderick born 14 Nov. 1871. 5) Emily Jane born 15 May 1853. 6) Alice Clara Mary born 9 June 1862. Lineage ~ This branch of the great clan Macdonald settled on the DeeSide, after the Lord of the Isles engaged the King’s forces at the battle of Harlaw, 1414. There seems to be no authentic account of the heads of this branch of the Macdonalds till 1630, when mention is made of Alexander MacDonald, known by the name of Marcus. His great-great-grandson, James MacDonald, of Ranathan, born 1702, married 1731, Helen, daughter and heiress of Ludovic Grant, of Tullach, and had, with other issue, William his heir, Christina, eldest daughter married John Farquharson, Esq., a military officer, a descendant of Findlamore, and had a son, James Alexander Farquharrson, General in the army, Governor of St. Lucia born 1775; married Rebecca, daughter and coheir of Sir George Coquhoun, Bart of Tully Colquhoun. She was born 1777 and died 1855. He died 1834, aged 28, leaving issue, William MacDonald Farquharson Colquhoun, now of St. Martin’s. Charlotte Grace daughter unmarried. Fanny Maria married 1851, Rev. Valentine Grantham Faithfull, M.A. Incumbent of Trinity Church, Edinburgh, and has Robert Colquhoun; Clare Rebecca; and Ida Valentine. James Macdonald died 1776, aged 74, and was succeeded by his son, William MacDonald of Ranathban and St. Martin’s born 1732; married daughter of Kinloch, of Kilrog and Logle, and left a son, William MacDonald, who succeeded his father 1814. 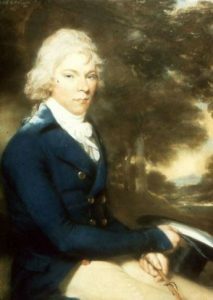 He married 1803; Grizel, eldest daughter of Sir William Miller, Bart. of Gleeulee, Lord Glenlee, and dying 1841, was succeeded by his cousin, William MacDonald Farquharson Colquhoun MacDonald, now of St. Martin’s. 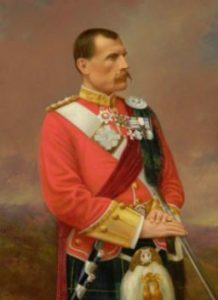 McDonald, Alastair Mac Lan, of Dalchosnie, and Dunalastair, County Perth, born March 22, 1830, Major-General in the Army A.D.C. to H.R.H. the Duke of Cambridge. Lineage ~ This family, distinguished by the gallant military services of it’s members, descends, through the MacDonalds of Keppoch, from Alexander, son of John, Lord of the Isles, by the Lady Margaret his wife, daughter of King Robert II of Scotland. The great-great grandfather of the present representative, Alexander McDonald, Esq. of Dalchosnie, born 1696 an officer in the the Highland army, fell at Culloden 1746. He married 1718, Janet, daughter of James Stewart, Esq. progenitor of the Stewarts of Tempey, Lepintullich, and Crossmount, and by her had (with a daughter Barbara, who died unmarried 1819 aged 92) three sons, Allan, killed in action without issue; John of whom presently; and Donald, Writer to the Signet, who died without issue. The 2nd son, John MacDonald, Esq. 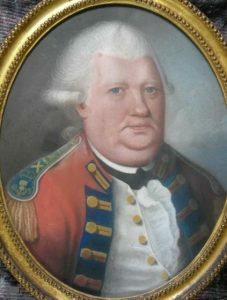 of Dalchosnie, born 1721, served as an officer in the Highland Army 1745-6. 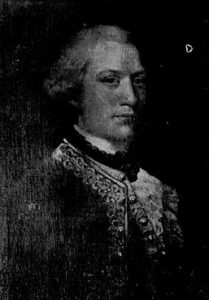 He married 1761, Mary daughter of Robert Menzies, Esq. of Glassie, County Perth, and by her had (with numerous ofther children, all of whom died unmarried), 1) Alexander, his eldest son born August 12, 1762; a Major in the army; married November 11, 1787, Elizabeth daughter of Alexander Menzies, Baron of Balfracks, County Perth, and predeceased his father July 1803, having had issue i) John, late representative ii) Alexander, Lieut. 92nd Highlanders died unmarried October 5, 1813 of wounds received at the Pass of Maya July 25 preceding. iii) William, Lieut. 81st regt. died unmarried 1839. iv) Donald, late a Capt. in the 68th regt. died unmarried 1835. v) James, Capt. 92nd Highlanders duied unmarried 1840. vi) Mary Anne died 1807 aged 10. 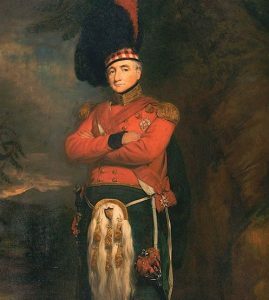 2) Donald (the 5th son), a very distinguished officer, commanded the 92nd Highlanders at Waterloo. 3) Robert (Rev.) the 11th son. Mr. McDonald died 1809 was succeeded by his grandson, Sir John McDonald, K.C.B., of Dalehosnie and Dun Alastair. J.P., Gen. in the army, and Col. 92nd Highlanders, born September 10, 1788; married Septemeber 12, 1826, Adriana, eldest daughter of the late James McInroy, Esq. of Lude, Perthshire and had issue, 1) Alastair MacIan, now of Dalchosnie, 2) John Allan late Capt. 92nd Highlanders born March 22, 1834. 3) Charles William, Capt. 93rd Highlanders born October 15, 1835; killed inside the breach at the assault of the Begum’s Palace at Lucknow, March 11, 1837. 4) Elizabeth Moore Menzies 5) Adriana 6) Jemima. Sir John McDonald became representative of the Keppoch branch of the MacDonalds before his death, by the decease of some of it’s remaining descendants. He died June 27, 1866. MacDonald, Donald, Esq. 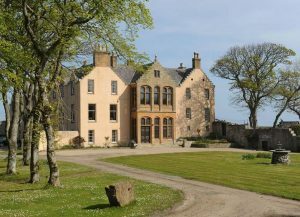 of Sandside House, County Caithness, J.P. and D.L. late Capt. Royal Engineers born September 2, 1791; married October 26, 1826, Lady Ramsay Maule, 5th daughter of Lord Panmure, and sister of Fox, Earl of Dalhousie, and by her had issue, 1) William Donald, Lieut.-Col. in the army, and later Major 93rd Highlanders, born September 15, 1827; married 1860 Emma Anne Elizabeth, daughter of the late Colin Lindsay, Esq. 2) Henry born December 3, 1831 3) John Crauford born August 7, 1833 4) Arthur Ramsay born June 30, 1835 5) Dudley Ward born June 8, 1840 6) Mary 7) Patricia deceased. Lineage ~ Donald MacDonald, Esq., Col. in the army, and Brig-Gen. in North America, whose family came origninally from the Isle of Skye, married Jane Aitken, and had (with three daughters 1) Jane married P.G. Craufurd, Esq. 2) Susan 3) Ann) and only one son, John MacDonald, Esq., Col. Royal Marines married 1789, Mary eldest daughter or Willian Innes, Esq. of Sandside, by Mary his wife, daughter of Sheldon Cradock, Esq. of Hartforth, County, York, and had one son, Capt. Donald MacDonald, R.E. of Sandside; and two daughters, Mary and Jane married James Bridges, Esq. Arolla. Macdonald, of Dalchosnie, co. Perth. This word is inscribed on the banner which forms part of the crest grunted to (Job John Macdonald, C. B , in commemoration of the good service rendered by him at that place. Coelestia sequor. I follow heavenly things. Craggan phithich. The rock of the raven. Cuidich an high. Assist the king. Cuislcan mo cridhe. The pulsation of my heart. Dhandeon co heiragh ali. In spite of who would gainsay. Nec tempore, nec fato. Neither by time nor fate. Per mare, per terras. By sea and land. Pro rege in tyrannos. For the king against tyrants. Sure. Macdonald. Crest— A tower upon a rock. Toujours pret, or prest. Always ready. Victoria cel mors. Victory or Death. Macdonald after Bosvile,  Vol. XXXV, fol Maj.-Gen. and Barou Macdonald,  Vol. XXXV, fol. 11. 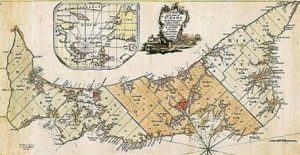 Macdonald to Bosvile,  Vol. XXXIX, fol. 228. Macdonald, Lieut.-Col. (Sir) John, of Dalhousie, co. Perth, Scotland,  Vol. XXXVII, fols. 297 and 299. „ Gen. Sir John, G.C.B. [17 Sept. 1847], Adjutant-General of the Forces. Supporters,  Vol. XLIX, fol. 156. MacDonnell, late Kerr, [1836, 4th] Earl of Antrim, of Ireland,  Vol. XLI, fol. 3i5 ; [1855, 5th Earl] Vol. LI, fol. 3i7. Dwight Macdonald (1906–1982), American writer, editor, social critic, philosopher, and political radical. 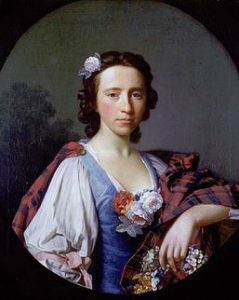 Flora MacDonald (1722—90) helped Bonnie Prince Charlie escape from the Hebrides dressed in her maid’s clothes. The British briefly imprisoned, then pardoned, her. Jacques-Alexandre MacDonald (1765—1840) had a brilliant career as one of Napoleon’s top generals (his winter crossing of the Alps was favorably compared to Napoleon’s own crossing of the St Bernard Pass). 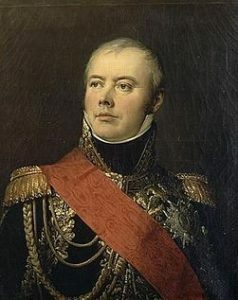 Arrested for anti- Bonapartist plots, he was regarded as so indispensable that he was pardoned and recalled to duty when France was threatened by Austria. He went on to be a Marshal of Empire and member of the Legion of Honour. Sir Hector MacDonald (1853—1903) distinguished himself in the Afghan War, the Boer War and the Sudan where, as a major-general in command of Egyptian troops, he became a national hero and was voted Parliament’s thanks. Alexander McDonald enlisted June 28, 1775 in New York. Allexr McDonald enlisted in Virginia. Briant McDonald enlisted in Massachusetts. Cath McDonald enlisted in Pennsylvania. 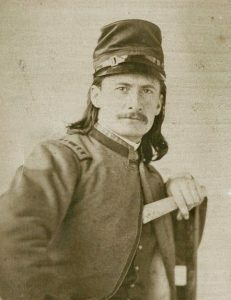 Charles McDonald enlisted in Pennsylvania. Collin McDonald enlisted in New York. Corl McDonald enlisted in New Jersey. Corr McDonald enlisted in New Jersey. Daniel McDonald enlisted in Maryland. 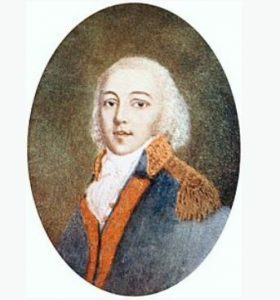 Jno McDonald enlisted July 1, 1775 in Virginia. John McDonald enlisted October 13, 1775 in Virginia. John McDonald enlisted in Virginia. Rank of D.M. John McDonald enlisted in Virginia. Rank of D.W.
Pat McDonald enlisted in Pennsylvania. Roger McDonald enlisted November 10, 1775 in Virginia.